The year is 2163. Starship Icarus XB 1 embarks on a long journey across the galaxy, to search for life on the planets of Alpha Centauri. Icarus XB 1 is a film by Jindrich Polák, based on a short story by Stanislaw Lem. 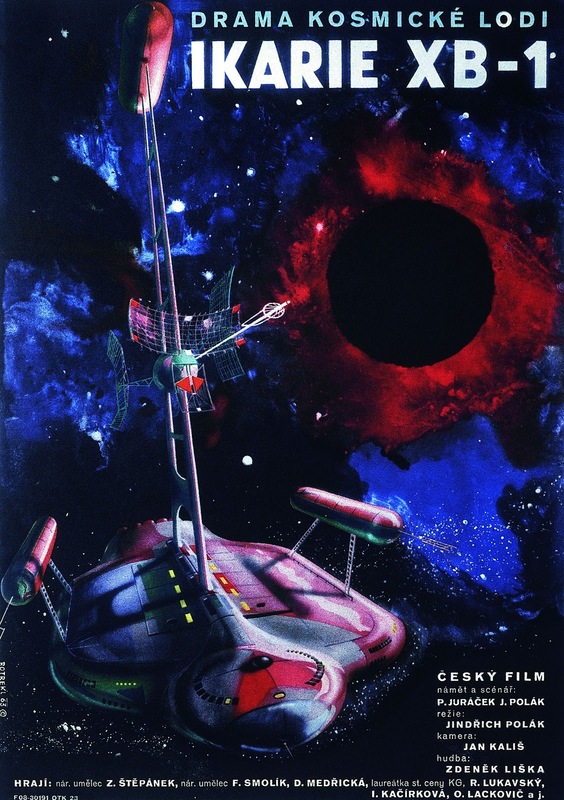 An intriguing addition to the short lived Eastern Bloc sci-fi craze of the early 60's, inspired by the ongoing space race with the United States. It's set aboard the titular spaceship bound for Alpha Centauri, on a mission to search for extraterrestrial life and differs from most other sci-fi movies of its era by focusing mainly on the physical and psychological challenges faced by the crew, rather than some evil alien menace. The story jumps around mostly following various crew members, examining their personal relationships and issues while the ship carries on to their destination. All goes smoothly until about the half-way mark when they encounter a mysterious derelict craft. The captain orders a small landing party to investigate, and things get complicated from there. Surprisingly, it comes across rather well made and does not appear as dated as you would expect. Of course the spacescapes and primitive model ships aren't exactly convincing, however the widescreen black and white cinematography looks great, and the interior sets and costumes are impressive. It could be argued that some of these images had more than a passing influence on the look of the later 2001: A Space Odyssey, and Star Trek. I must warn though, that dramatically the film lacks any real suspense or excitement, and the main conflict device is rather bland in execution. Still it is a solid and original effort with fantastic sets, more substance than the typical 60's sci-fi movie, and provides an interesting foreign look at the future. It makes me wish there were more like it. Perhaps not, but there is some evidence. They both show the not so exciting every day life of a space voyage. And a few of the shots look similar to me, in particular the ships long hexagonal walkways. It may predate 2001: A Space Odyssey but did it really influence it? I have to see this one! Stanislaw Lem also wrote the story that Tarkovshy's Solaris was based on as I remember well! Nice review BT! I'm not sure.. I want to, but the suspense part.. Why can't you lie to me and make me feel 100%!? Guh.